The most exciting club to hit has to be the “Big Stick”, or more commonly named the driver. Of course the most common result with most high handicappers is a big slice! 3. Club is delivered on a slight inside path to the ball. 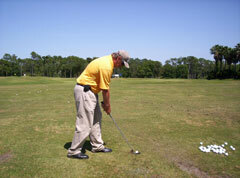 Club is released, right arm parallel to target line, toe is up.